This is my video journal from Day 6 of my January 2013 trip to Death Valley. In this video, I share a few thoughts on perspective, workshops, and I even manage to take a photo. 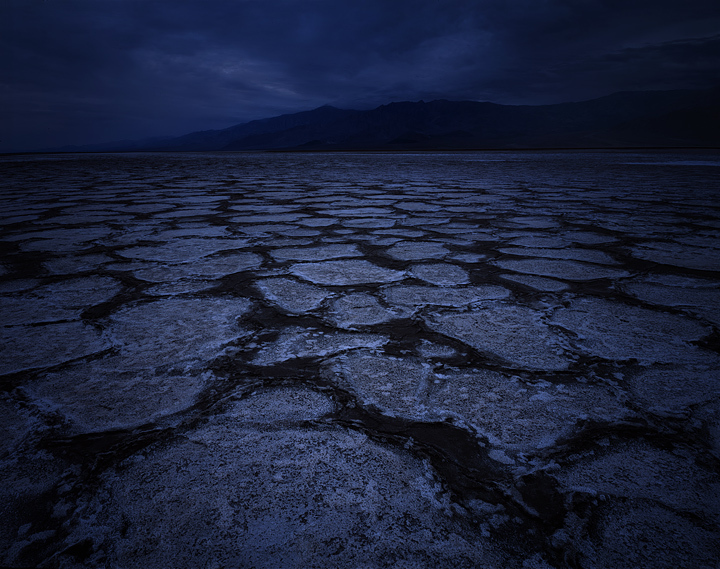 This entry was posted on March 22, 2013 at 7:05 pm and is filed under 8x10, Death Valley January 2013, Photo Trips, Photography. You can follow any responses to this entry through the RSS 2.0 feed. You can leave a response, or trackback from your own site. A great shot Ben. I love the dark blue tones and really interesting shapes and patterns. The mysterious mood is fantastic! Excellent! Thanks Nick. There’s something about the blue evening light that I’m really drawn to, and I’m glad this location was good for it. Great tutorial Ben, I prefer the high position as well. WARNING: Long post coming! That’s too bad the workshop people were so badly behaved, but that’s not the experience I had when I took a workshop with David Muench last year. What I was expecting was a bunch of camera snobs, and I figured the field sessions would be us watching David work and we’d take notes. I couldn’t have been more wrong. If you’ve met David Muench you know he is the most unpretentious person you’ll ever meet who would never dream of having us just watch him, and the people who attended were an incredibly diverse bunch (ex. a quirky, volatile, genius composer and his best friend, a quiet sound engineer who exuded a zen-like calm) all of whom took wonderful pictures and it was a pleasure to see what each person pulled out of the locations we went. Not a camera snob in the whole bunch. Getting feedback on my photos from David was invaluable (I told him I wanted him to be brutal) and my photography improved an order of magnitude. Going to a place and seeing what someone like David can pull out of it was priceless. As I left the workshop I realized I’d had the experience of a lifetime. At the end of the workshop they had us fill out an eval and suggest workshops we’d like to attend in the future, so I figured what the hell, put my dream workshop-David Muench in Southern Utah in fall. Sure enough, he decided to do it! It’s in November in Zion, and I’m counting down the days. I’d be going to Zion anyway but I already know what I see there; getting to see what David Muench sees in Zion will be worth the price of the workshop by itself. It’s great to hear that you’ve had such an excellent experience with the workshops you’ve participated in. There are definitely some great ones out there where the participants walk away with an overall wonderful experience. For each of those workshops though, there are likely quite a few that are almost predatory in nature. They simply guide people to tourist lookouts, and no one receives any one-on-one time with the instructor. These are the type that I often run into in the field. Perhaps my biggest issue I’ve seen with workshops is that many of them are conducted illegally. Teaching these workshops requires a commercial use agreement through a proper permitting process. The workshops must state the locations they will visit and when, they must carry liability insurance, and they must also have valid CPR training. The permit process sounds reasonable enough to me, but many people feel it is better to break the law and ask for forgiveness rather than do what is required. Since this is an unregulated industry, it would be great to have a Yelp-type website where uses can review the workshops they’ve taken, and workshop operators can post their credentials to ensure that they are legally conducting workshops within the national park system. My guess is that such a site would radically change the face of workshops as we know them. What a shame to hear that! I see a lot of informal invitations for “workshops” that are probably the predatory types like you describe. I guess it’s like any trip-you should only sign up through the reputable places. I signed up for both workshops through a well-known gallery. Your patience is way beyond mine. That blue shot is really sublime though. Thanks for the kind words. Whenever I find a composition I like, I don’t mind sitting on it for quite some time. I don’t have anything else to do out there, and listening to podcasts really helps to kill time! I’ve never used any cc filters while shooting. Sometimes there might be a bit of a color cast, but I can always fix it on the computer. In this case though, I didn’t end up with any adverse color shifts from the long exposure. I’ve read about this when using Velvia for long exposures, but I’ve never really encountered any issues with it. I really enjoy taking photos during the time before sunrise, or after sunset when everything goes blue. It really gives a calm feel to the scene, and can even make a cloudless evening look quite nice. I try not to push Velvia longer than a couple minutes, so this was right at the limit of my comfort zone with that film. Landscape photography is like the 60s….it’s hard to get high enough. I agree with your views in this video. I’ve been following your blog for a little while now and I am inspired by your approach to landscape photography. It’s strikingly similar to my own, and when I can’t get out, I visit your blog to help keep my spirits up and motivation charged. I know it’s frustrating at times, but I think you’re stubborn like me, and welcome the challenge, just for that one shot. The memory of all the time and effort it took dissolves upon viewing that winning image. Keep up the excellent work. I have been shooting 4×5 for about 10 years now and I just jumped into 8×10 this year. My early test images already have me itching to get out and find some real images to burn on film. Can’t wait!